Built in 1895 and located in the historic Irvine Byrne building, the Pan American Lofts features 40 condo loft residences from 658 – 1,248 sq. ft including 10 penthouse units with internal mezzanines and private rooftop terraces. 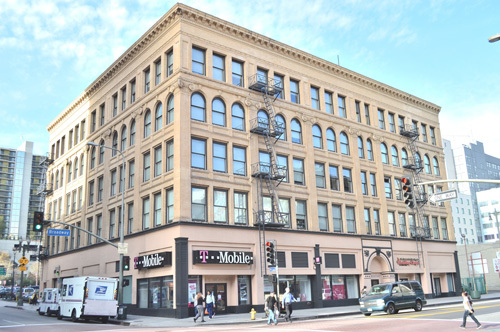 The Pan American Lofts is located in the Financial District of the Historic Core on the corner of 3rd and Broadway across from the Million Dollar Theatre and the Bradbury Building. It was designed by Sumner Hunt and built in 1895. It is notable for it’s Spanish/Colonial Beaux Arts architecture that is evident in its intricate terra cotta detailing, arched entryway and windows. The building was modernized by the Urban Pacific Builders and Donald Barany Architects in 2007. The Pan American Lofts features exotic bamboo flooring (select units), original exposed brick and concrete walls, 12’ to 17’ interior ceilings, bountiful natural light, high-end stainless steel appliances, controlled-access subterranean parking, interior common courtyard, Juliette balconies and private decks in select units. Long Beach based developer Urban Pacific Builders transformed the building. A new roof was added, the garage ceiling was raised, a new elevator was built and the rows of offices were converted into spacious lofts. An interesting bit of history about the building is that the halls and Hitchcock staircase have been immortalized in many of Alfred Hitchcock’s movies, Brad Pitt’s “Seven,” “Fight Club,” “Blade Runner” and numerous TV shows and commercials.